One young boy often tripped while trying to get up the stairs at his house without help. Another would not ride his bike without training wheels. A third had no rhythm when he danced. But after a month of classes in martial arts, all three boys on the autism spectrum improved their motor skills enough to achieve these milestones on their own. “So many parents were so thankful and said they noticed improvements in their child’s balance and coordination,” said Hilary Yip, a master’s candidate in music therapy at the University of Miami Frost School of Music. 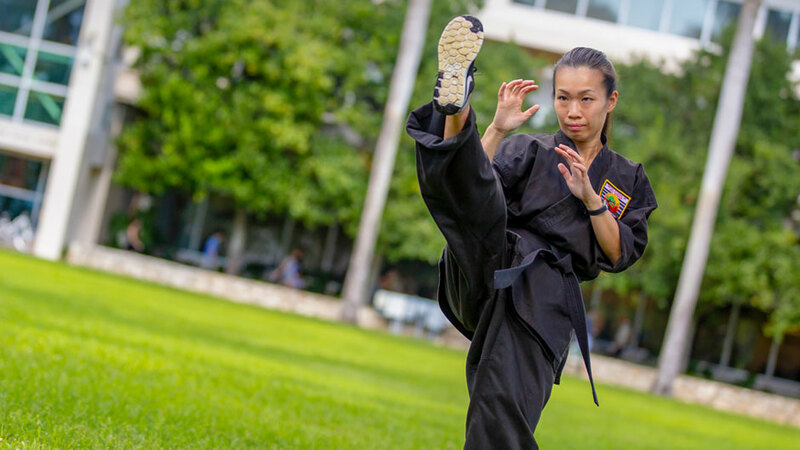 Yip, who has practiced and taught martial arts for 15 years, recently combined her interest in martial arts and music therapy for her thesis project. She designed individual martial arts sessions for boys with autism between the ages of 7 to 12 that she hoped would improve their gross motor skills. Using the sounds of snare drums, bongos, and bells to prompt different movements, Yip taught ten boys a host of kicks, punches, and blocks that are fundamental to martial arts. And after a month of eight 30-minute classes, Yip’s students showed improvements in coordination on both sides of their bodies. “Our rhythm and motor skills are processed in similar areas of the brain, so when we hear rhythm, our brains are primed to do movement, which enhances our execution of those movements,” Yip said. Yip got the idea to pair music and martial arts after seeing other music therapists use guitar and piano to help patients with a variety of disabilities learn movement. After working as a music therapist at a special needs school, Yip began to explore the idea that a music/martial arts combination could be particularly helpful for children on the spectrum. Affecting an estimated one in 59 children, autism spectrum disorders (ASD) is a developmental disability that can cause social, communication, and behavioral disabilities, but it touches each affected person in different ways. While learning, thinking, and problem solving may be difficult for some on the spectrum, these tasks may be simple for others. Since Yip was aware that ASD affects boys four times more often than girls, she decided to limit her study to boys. Anibal Gutierrez, a psychology professor who is also associate director of the Center for Autism and Related Disabilities (CARD) at UM, and director of the Intensive Behavioral Interventions Clinic (IBIS), said that studies suggest many individuals with autism experience motor difficulties. He finds interventions like Yip’s encouraging. “It is always reassuring to see that these interventions, when they focus on learning a skill, can actually help,” said Gutierrez, whose IBIS clinic provides evidence-based therapy to children as young as two years old who are diagnosed with autism. While Yip’s intervention is focused on using rhythm and martial arts to improve motor coordination, she said that additional studies could show whether improved motor skills also help boys overcome the social challenges that often accompany autism. Although a few studies have shown a correlation between improvements in motor skills and social skills, Gutierrez cautioned against drawing a direct link. Nevertheless, he said if children feel more confident with their coordination, they may be more comfortable to interact socially. Music therapy professor Shannon de l’Etoile, who is also associate dean of graduate studies at the Frost School of Music and Yip’s adviser, said that while researchers have spent a lot of time looking at how music and rhythm affects movement, she has never had a graduate student incorporate martial arts. de l’Etoile hopes Yip will continue to study this combination.